Working with this client is always fun! Over the past 2 and 1/2 years, we’ve been updating the home she shares with her husband and two daughters…..with a 3rd on the way! Dream come true for me! 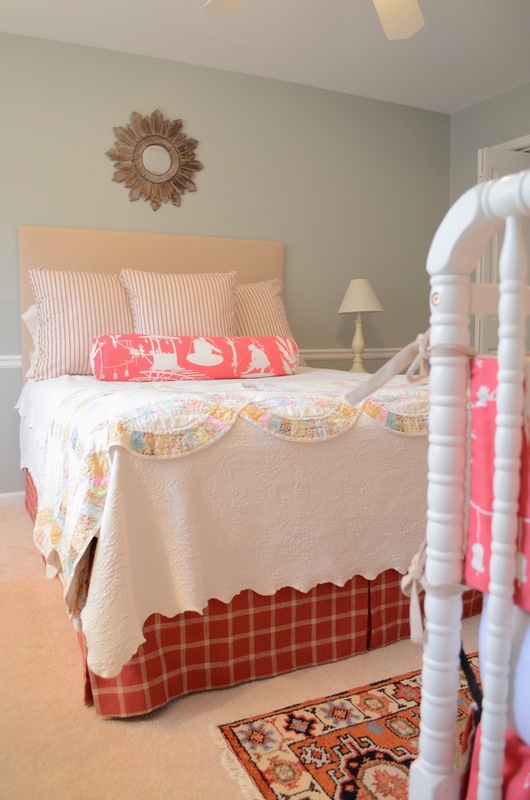 :)) I love all the pink in this house….dolls, clothes, pillows, and more all in true girly fashion. Click here to see more of their home. 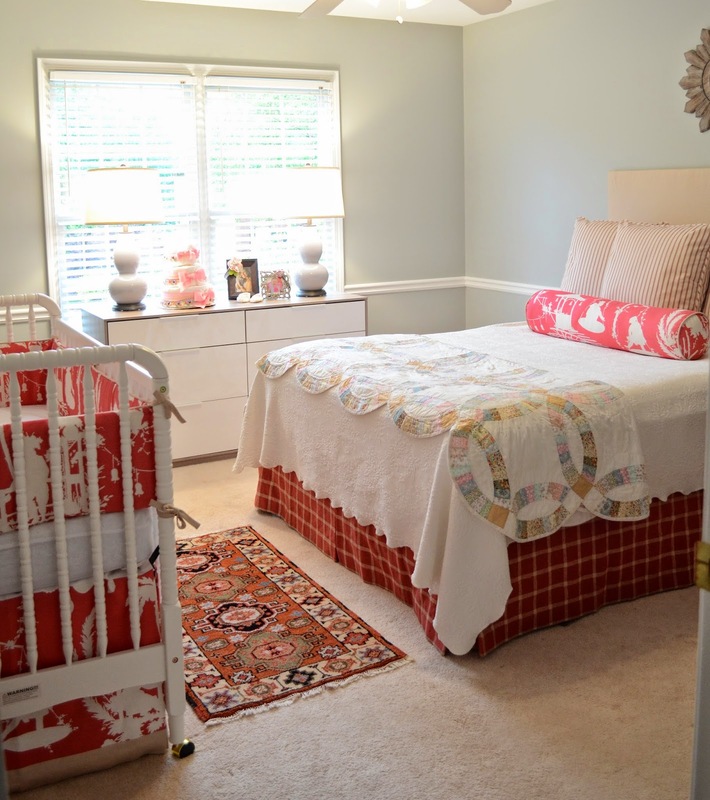 When my client called to say there was another baby on the way, we discussed the possibility of a joint nursery and guest room – with limited space, they needed a place for guests too! I think our result is both fun and sophisticated, feminine and welcoming, and most of all, ready for this baby girl who will be here in about a month. A few more finishing touches are on the way, but we’ve made maja progress so far! 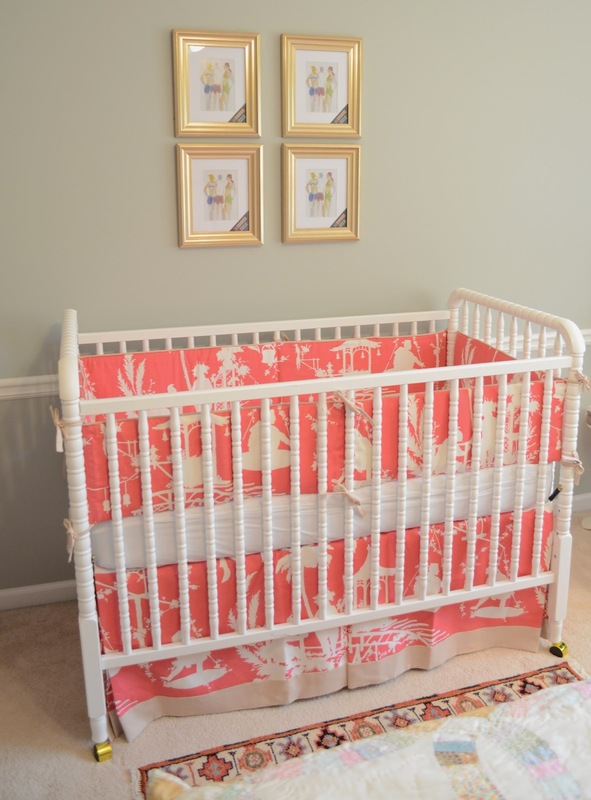 We’ll have 4 small pagoda watercolors in these simple gold frames, over the classic white Jenny Lind bed now outfitted with a chinois chic pink and white toile. I. am. obsessed. with this fabric. 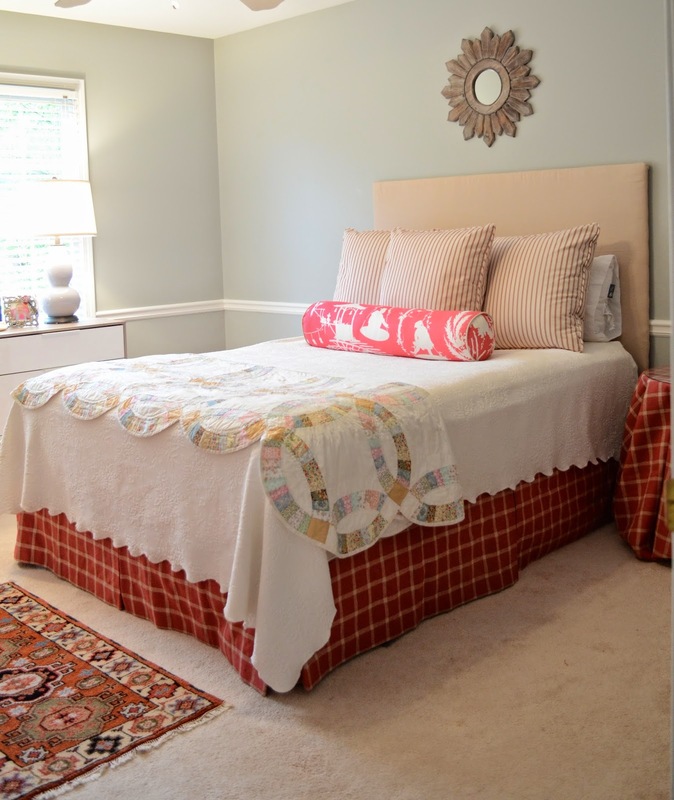 A dash of traditional style lays before the bed in a fun antique-inspired rug found online. 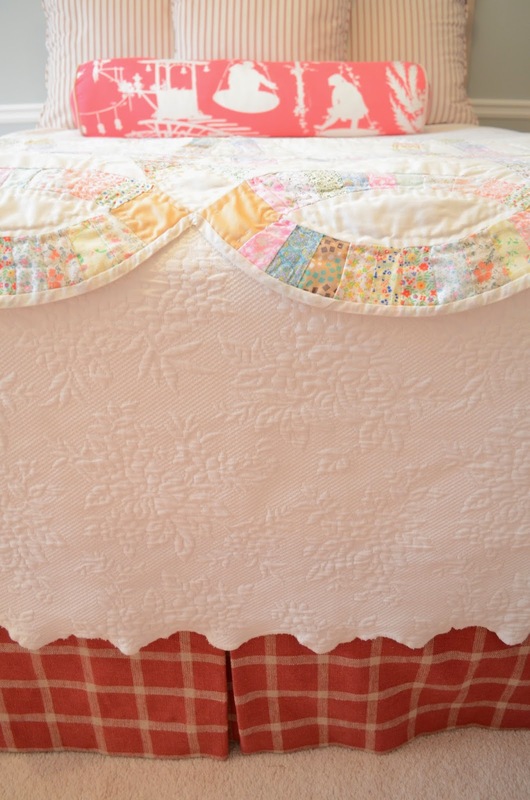 The color inspiration for the room came from this antique quilt, made by their great-grandmother. Shades of pinks and grays both were found in the delicate patch work, and set the color scheme for the room. Texture is provided with the wooden mirror over the simple pink linen upholstered headboard. 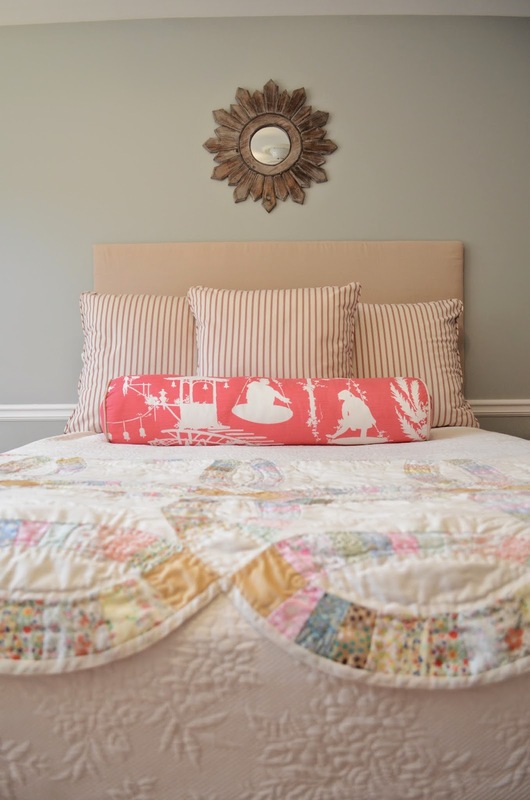 Classic ticking striped euro shams grace the bed as does a girly bolster covered in the same chinois toile. 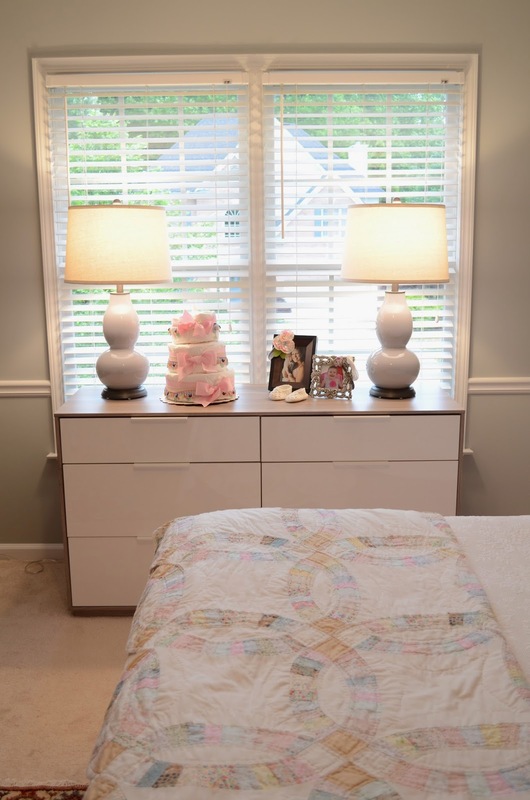 A chic raspberry window pane bedskirt will grow with the soon-to-be-here occupant of the room. One of my go-to’s: A fabulous pair of gray ceramic gourd lamps! Now atop the mid-century mod dresser. It’s all about the mix! There will also be two pink linen drapery panels framing the window. We are waiting on nightstands and lamps to arrive. Hope you enjoyed this little reveal on this lovely Monday!